At TheBestVPN, we generally advise against the use of free VPNs. 3. Some free VPNs have gotten caught using shady practices like injecting ads, referring affiliate traffic and more (more info can be found on the CSIRO research and FTC complaint against a free VPN). Unlike other free VPNs, Hola gives you unlimited data without displaying ads — no wonder 152 million people use their service. Unfortunately, like mom told you, if it sounds too good to be true, it most probably is. A group of security researchers discovered multiple flaws in Hola and found that they aren’t as noble as they claim. Besides the fact that Hola turns your computer into an exit node, they also sell access to your computer and network to third-parties through their commercial brand, Luminati. How do you opt out of this? There’s only one way: by subscribing to their premium subscription (proving once again that nothing good comes free). It even gets worse: it was proven that Hola can be exploited to allow anybody to execute programs on the computers of its users. They share your email with their marketing partners. They sell your traffic to users of their business arm, Luminati. They can share your “anonymous” information with third parties. They sell access to your computer and network – making it serve as an exit node through which other users (including people paying them) can access the Internet – although they didn’t indicate this on their website, it has been widely reported (since 2015) by reputable media publications. Worse, the CSIRO research paper on free VPN apps found that Betternet has the highest number of tracking libraries of all free VPN services (14 in total). By allowing advertisers to track and log your data – basically giving them carte blanche access to as much of your information as they need. By allowing advertisers to include cookies in your browser. By displaying ads, including sponsored apps, videos, and other types of ads. Opera’s free VPN is a free VPN service that comes embedded in the Opera browser: you install the browser and have access to the free VPN service. On the surface, the “catch” of the free VPN seems to be simple: to drive adoption of Opera’s browser. We wish it were that simple! By sharing your data with third-parties and marketing partners. By allowing advertisers and marketing partners to track your data. With over 500 million users, Hotspot Shield is undoubtedly the most popular free VPN service. When you have that many users, you have data that is a potential goldmine for advertisers… and Hotspot Shield is certainly not just being charitable by providing free VPN to hundreds of millions of people. 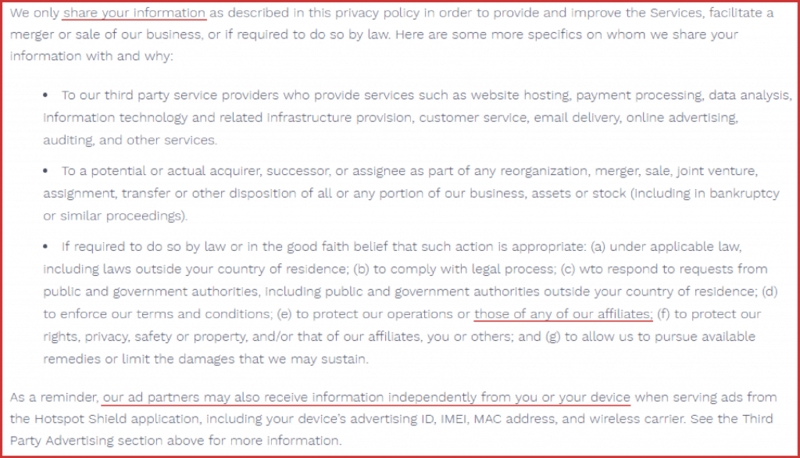 While Hotspot Shield makes it clear in its terms of service that it displays ads to users of its free VPN service, it is not very upfront about the fact that it makes money off users through other unscrupulous means. Less than a year ago, The Center for Democracy and Technology issued a complaint to the FTC claiming that Hotspot Shield not only shares data of its free VPN users, but it also redirects their traffic to third-party affiliate sites. May share your data with 3rd parties. By redirecting your traffic to affiliate partners (FTC Complaint in 2017). By displaying advertisements in front of apps and websites you use. By setting you a data cap of 500Mb/day. When it comes to the free VPN game, Psiphon is no newbie. They’ve been offering their free VPN service since 2008, which is a long time in the Internet age. However, they support their ability to offer this free VPN by sharing your data with advertisers and letting advertisers track your data usage. 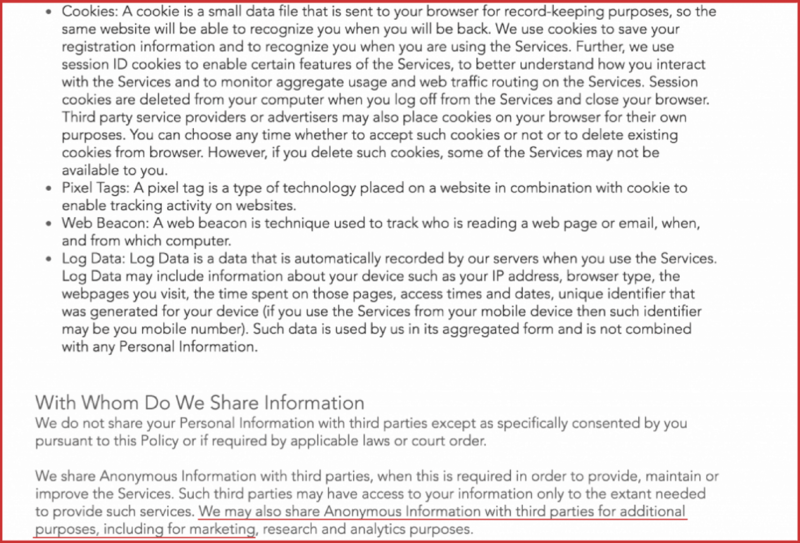 While they generally defer to their advertising partners’ privacy policies, the policies of these partners show that they do use and share your data. With annual revenue estimated to be over $2.2 million, Psiphon sure seems to be making some money! By sharing your data with their advertising partners. By allowing their advertising partners to track your Internet usage. By displaying ads to you. They share your information with affiliates and third-parties. They use your information for several purposes including advertising and marketing purposes. They display ads to you. With more than 8.2 million users, ZPN is certainly not a free VPN service you can ignore. The 10GB monthly data they offer is generous compared to what is offered by other VPN services. There’s a high possibility of sharing your data with their partners. By limiting your monthly data to 10GB per month in order to get you to upgrade to a paid plan. By limiting your bandwidth in order to get you to upgrade to a paid plan. By disabling P2P (and torrenting) and limiting your access to five locations in order to get you to upgrade to a paid plan. Overall HoxxVPN has a very sketchy logging policy. It’s very long and confusing. However, if you try to read it over and over again, you’ll soon understand that HoxxVPN has several ways that let it continue making money from a free user. They log your information for their own purpose to share it with 3rd parties. They let you upgrade to their paid version. FinchVPN seems more secure than most free VPN services. They have a generous 3GB monthly data and seem to take user privacy more seriously than most free VPN services. However, they limit the number of servers you can access in order to get you to upgrade. They may also share data of user activity with third parties. They may share aggregate data of users with third-parties. They limit your monthly data to 3GB and restrict the number of servers you can access in order to get you to upgrade to a paid plan. TouchVPN is another shady, free VPN that adds Cookies, Pixel Tags, and Web Beacons to your browser while you use their service. Though they are some-what upfront about sharing your “anonymous” data with third parties for marketing purposes. Sadly, they don’t elaborate much on “anonymous data”.